Cult US heavy metal act TITAN FORCE has inked a deal with Skol Records. 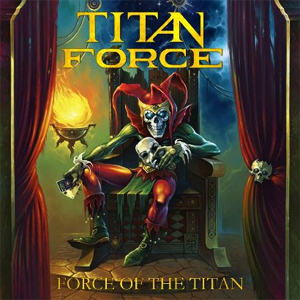 The band's first release for the label will be Force Of The Titan, a collection of 12 previously unreleased studio tracks recorded in the '80s: the complete demo from 1985 - recorded when the band was using the TITAN name, featuring John Flores on vocals - and eight classic tracks from the first two TITAN FORCE albums in alternate and previously unreleased demo versions, with Harry Conklin (JAG PANZER, SATAN'S HOST) on vocals. "All tracks were transfered from original tapes and have jaw-dropping sound quality,” says Skol Records CEO, producer Bart Gabriel. "It's incredibly huge honor to have them on Skol Records. They are one of the amazing Heavy Metal bands that ever walked the earth. And this compilation is just the beginning. We have few jokers hidden in our sleeve!" TITAN FORCE will perform at the already sold-out Keep It True festival on April 24-25, 2015 in Lauda-Konigshofen, Germany. The event will be headlined by recently reformed original lineup of EXCITER and RIOT V. TITAN FORCE will also appear at the Up The Hammers festival on March 6 and 7, 2015 in Athens, Greece.